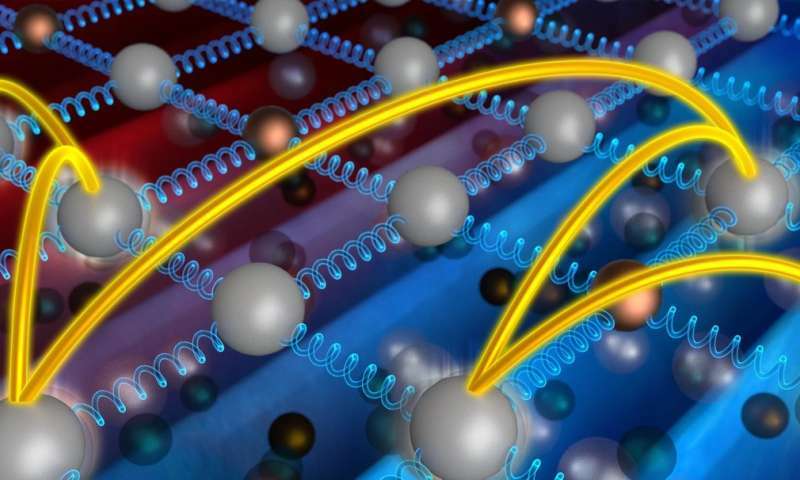 "We saw evidence for what Einstein first proposed in 1911—that heat energy hops randomly from atom to atom in thermal insulators," said Lucas Lindsay, materials theorist at ORNL. "The hopping is in addition to the normal heat flow through the collective vibration of atoms." "Our predictions were two times lower than we observed from our experiments. We were initially baffled," Lindsay said. "This led to the observation that another heat transfer mechanism must be at play." "The thallium-based material we studied has one of the lowest thermal conductivities of any crystal," Lindsay said. "Much of the vibrating energy is confined to single atoms, and the energy then hops randomly through the crystal." "Both the sound waves and the heat-hopping mechanism first theorized by Einstein characterize a two-channel model, and not only in this material, but in several other materials that also demonstrate ultralow conductivity," said ORNL materials scientist David Parker. For now, heat-hopping may only be detectable in excellent thermal insulators. "However, this heat-hopping channel may well be present in other crystalline solids, creating a new lever for managing heat," he said. The study's lead coauthor was Saikat Mukhopadhyay, a former postdoctoral research associate at ORNL and currently a National Research Council research associate at the U.S. Naval Research Laboratory. Additional coauthors of the paper titled, "Two-channel model for ultralow thermal conductivity of crystalline Tl3VSe4," included ORNL's David S. Parker, Brian C. Sales, Alexander A. Puretzky, Michael A. McGuire and Lucas Lindsay. Filed under "interesting" for now. Perhaps something useful or likely not. Knowledge is good just by being new and true. Well, I'm not sure how "free" the electrons are. The Laws of Thermodynamics dictates that everything, every event, has a "price" if not a "value". Does science know what is heat and how it arises, and what processes need to take place in matter and energy obtained from matter? How can one draw conclusions about the movement of heat through matter, if he does not understand the concept of heat. You are all rounded up by the story that there are heat conductors that leak different amounts of heat. Do you know how heat can spill (pass) through matter or through your vacuum? It is necessary to know who causes heat and how it is created and it will be possible to find out everything about it. But if this is not known in vain, there will be all attempts, as many problems can not be solved without knowing the properties and formation of matter. Does science know what is heat and how it arises, ...? Can you describe how science knows what the heat is and how it arises and what is the cause of its appearance.